This is what I arrived home to see the other day! 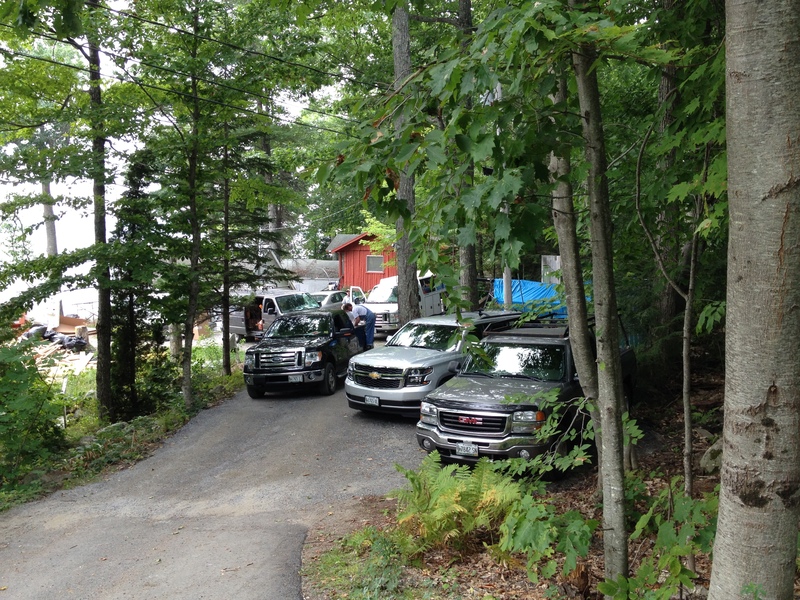 The driveway was full of vehicles! 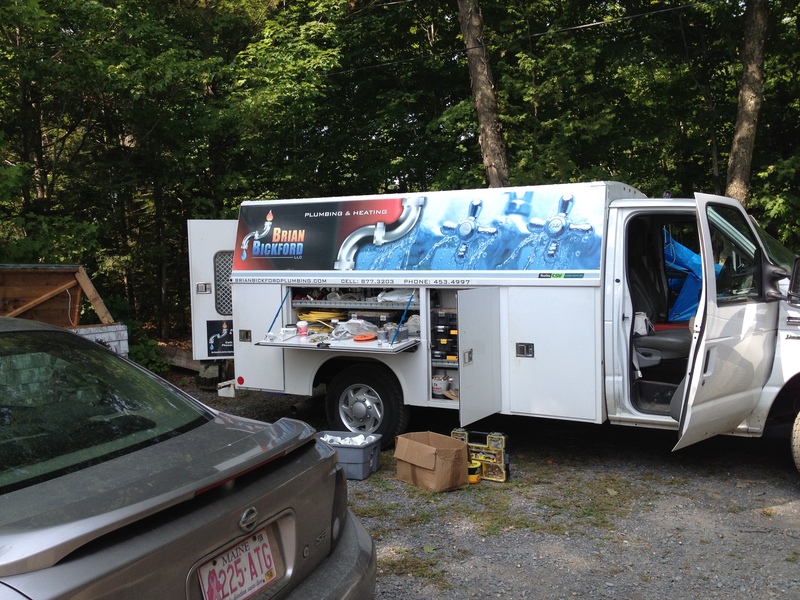 Plumbers and Electricians and Contractors, oh my! We found a plumber and his crew arrived en masse … and got the rough in completed in three days. Woo! Hoo! We are making progress! I was especially excited to see my tub in the guest bathroom upstairs! Thanks to Brian Bickford for the great and speedy job! And thanks to our friend Janna for the recommendation, too. The stain will look like driftwood … hopefully! Do we call this the front door? Today I went to check on the progress inside and it was all cleaned up! After the insulation went in, it was a mess! A MESS! (Did I yell it loud enough?) This afternoon it was all clean! Matt wins the golden broom award for cleaning up! I was shocked at how nice everything looks. Tomorrow when I am in Bangor at a quilting class, Ned’s going to finish staining the top half of the front (lake side) of the house and then the framing for the front porch can happen while the sheet rockers are inside working. Monday we call for our inspection. 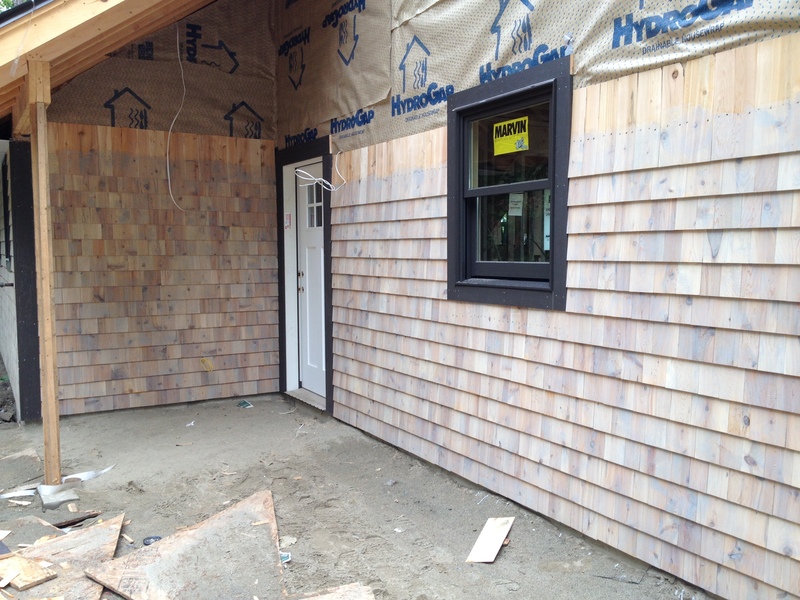 This entry was posted in Building a Home and tagged a special place, Brian Bickford, carpentry, closed in, construction, home building, insulation, Living in Maine, Messalonskee Chronicles, plumbing, stain, windows on September 11, 2015 by lindarockwell3. Hang in there! Soon the mess will be a distant memory and you’ll be able to sit back, relax and enjoy a glass of wine.